Prudential Plc’s Asian asset management unit, which profited from the rebound in 30-year Treasuries last month, has taken its money off the table with the view the three-week rally in U.S. government debt is coming to an end. Nicholas Ferres, who oversees multi-asset investments at Eastspring Investments in Singapore, unwound his holdings of 30-year bonds Friday and Monday, selling them at yields as low as 2.96 percent, after U.S. jobs and wage data backed the case for faster policy tightening. The fund manager bought those securities at levels above 3.10 percent last month when the Federal Reserve raised interest rates. “There is a risk that the Fed is behind the curve or has to tighten policy more aggressively than expected now,” Ferres said in an interview Monday. “The odds are yields will move higher,” he added. Eastspring managed about $140 billion as of June 30, according to its website. Ferres’s view echoed those of Bill Gross from Janus Capital Management who said on Bloomberg Television and Radio Friday that the $13.9 trillion Treasuries market is at an inflection point and close to breaking a three-decade trend of falling yields. 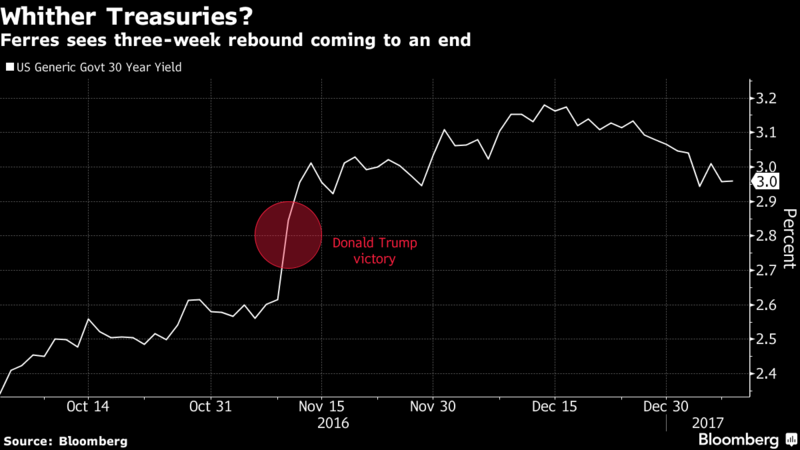 Their comments came after the Treasury market suffered its worst selloff in seven years in November on President-elect Donald Trump’s spending plans, rising inflation expectations and forecasts for Fed rate increases. Bloomberg’s gauge of the greenback has dropped about 1.5 percent since reaching an all-time high on Jan. 3. Hedge funds and other large speculators increased their net bullish dollar positions last week to the highest in about a year, according to Commodity Futures Trading Commission data. Derivatives traders are still pricing in the probability of two U.S. rate increases in 2017 despite the Fed signaling it may move three times. While Ferres expects the dollar to strengthen past parity against the euro and reach 130 yen if traders start factoring in quicker Fed hikes, he said betting on dollar strength is a “crowded trade.” Instead, he prefers emerging-market currencies and equities which offer more attractive valuations and will benefit from improving global growth. An index of emerging-market currencies gained 0.6 percent last week, after dropping almost 3 percent in the fourth quarter. Ferres said many developing-nation currencies are undervalued, while those of Brazil, Indonesia, Russia, Peru and Mexico have “positive carry” even after adjusting for inflation expectations. Eastspring has already started investing in emerging-market equities and is waiting for further gains in the dollar before buying developing-nation currencies, he said.